Keeping your social content calendar stocked full of timely Tweets, creative status updates and engaging social posts is a tall order. In fact, creating a social media editorial calendar is a process that requires careful planning and teamwork. Luckily, Sprout’s publishing tools are purpose-built to help you work efficiently, collaborate seamlessly and effortlessly manage your social publishing. 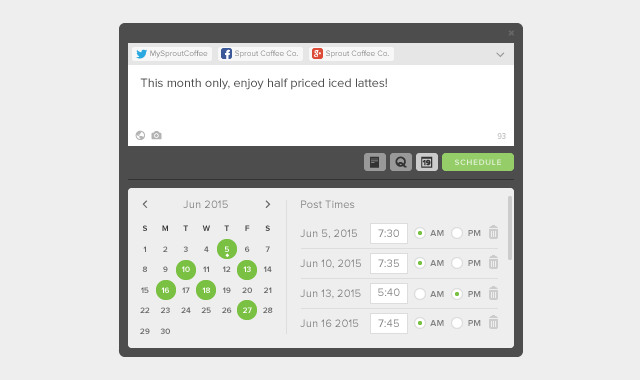 Today, we are pleased to release an enhancement to Sprout’s message scheduler in Compose that will save you time when planning and managing your social content calendar. You can now customize post times for each day when scheduling the same message to publish on multiple dates. To access the message scheduler, simply click the calendar icon in the Compose window. As you select your desired publishing dates by clicking on the calendar to the left, you can now set a unique post time for each corresponding date to the right. The post time for each additional publishing date selected will default to the last post time set. So, if you’d like to keep the same post time across all publishing dates, simply choose the first publishing date, set the post time for that date and then add all other publishing dates. Schedule as many dates with unique post times as you’d like! Research shows that reposting content multiple times across several dates is not only an acceptable practice, it’s actually an effective publishing strategy that can help your social posts garner more clicks and responses and increase your overall reach. In addition, it’s no secret that your fans and followers are not always online at the exact same time. Whether that’s due to managing social communities that span various time zones or just a result of differences in your followers’ social media habits, reposting content and spreading it across different times on multiple dates is an efficient and effective way to maximize your reach. Stay informed of all Sprout updates by visiting our Release Notes page, and as always, let us know if you have any questions or feedback.